Today’s guest blog post was provided by summer student intern Laura Lacquement. A native Iowan, Laura grew up south of Des Moines, and went to school at Martensdale-St. Mary’s. She started her college career at Valparaiso University, and later transferred to ISU, where she is now a senior studying Environmental Science. I enjoy travelling across the State of Iowa with Water Rocks! and Iowa Learning Farms. The location and events vary, while the field work remains consistent. 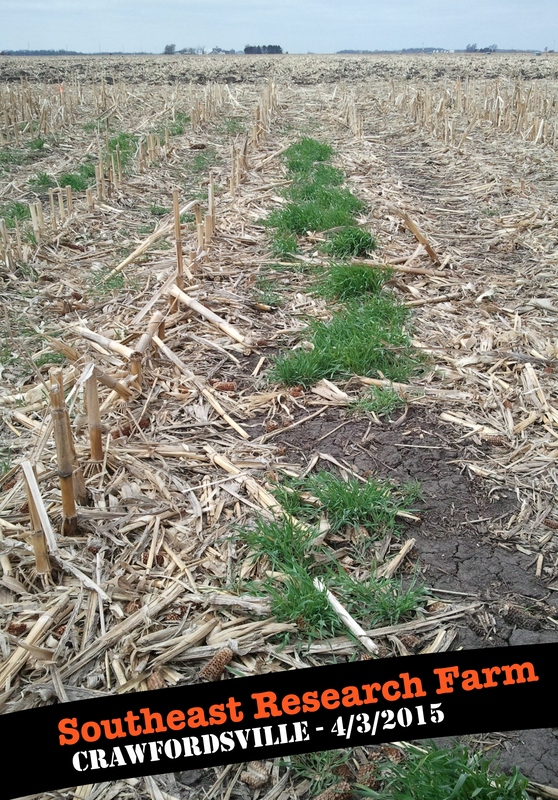 One of the projects I’ve helped with all summer long is ILF’s cover crop mixtures project. 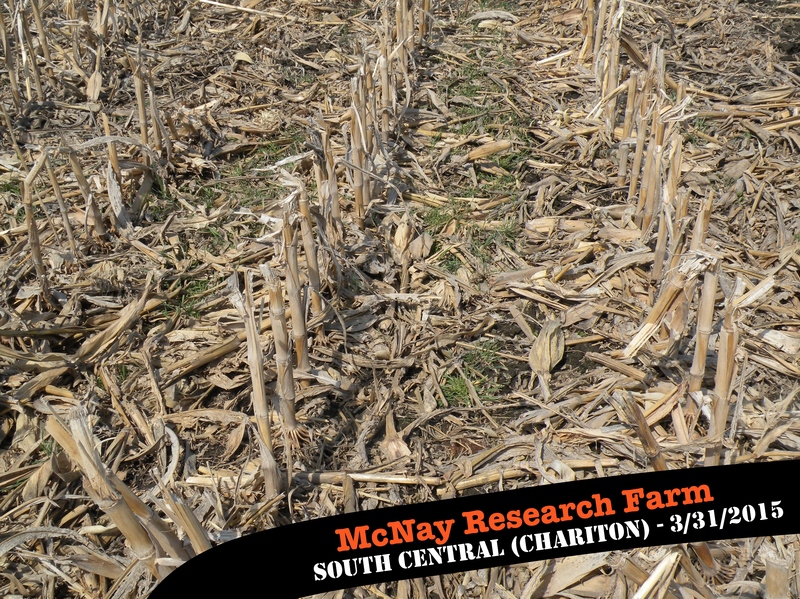 Each week we travel to three of Iowa State University’s research farms to collect water samples from lysimeters located in plots of corn and soybeans. Each block of plots contains 12 lysimeters placed between rows of corn or soybeans. Lysimeters measure the movement or storage of water in the ground. The lysimeters that the ILF team uses are composed of a tube two inches in diameter and two feet (24”) deep. The bottom of the tube is composed of a porous ceramic cup that allows the movement of water into the lysimeter from the soil around it. Using a vacuum pump, we create suction inside the tube that pulls water inside. Each week, we extract the water by using a flask that is connected to the vacuum pump on one side and a straw connected to its lid and inserted into the tube to its full depth. Using the pump and flask, we pull water from the lysimeter into a small bottle, where it will later be analyzed for the amount of nitrates present. Each lysimeter tube is installed so it’s flush with the ground. To protect the lysimeter, a four inch PVC drainage pipe plug and small pipe is placed above it. Most of our plots are located close to each other, with the exception of the plots at the ISU Northern Research and Demonstration Farm in Kanawha, Iowa. Finding the lysimeters there can be quite an adventure! At the start of the internship, all we could see of corn and soybeans in our plots were little sprouts an inch tall. In just a couple weeks, the corn grew past our knees to over our heads. I not only watched this growth, but experienced it firsthand by struggling to carry our devices and tools over and through the corn and soybeans to each lysimeter. On Friday, June 30, I traveled to Kanawha, Iowa, with Elizabeth to extract water samples from lysimeters there. As I mentioned, the plots here are not located right next to each other, but in completely different fields separated by a grass driveway. After we collected samples from the soybeans, we entered the corn in search of our small buried lysimeters in the shoulder-height corn. We walked inside each row looking for our lysimeters … for an hour or so. Our ILF plots happen to be in the middle of a much larger field, and the challenge is that there’s no easy way to flag or label the plots once the corn is this tall! We eventually ventured a bit south of our current location, where we recognized our plots and finally spotted a lysimeter only a short distance away. Small victories! Friday, July 7, I returned to Kanawha with Kaleb to collect more samples. This time, I knew exactly where to go to find the plot, but not the precise location of the lysimeters. In just one week, the corn had grown from the height of my shoulders to the height of me. I could no longer see over the corn. As I finished extracting each water sample, Kaleb would move to the next lysimeter. He may be the tallest of us interns, yet I still could not see him over the corn. To find him and the next lysimeter, I followed the sound of corn rustling and looked for his bright red shirt through the corn. If we do not wear bright colored shirts, a game of Marco Polo may be necessary! After these experiences, I’m now very confident where ILF’s plots at Kanawha are located, plus how to find the other lysimeters and interns in corn taller than me. Each time I take samples from the lysimeters, I have learned a little more about corn and soybean cropping systems, as well as water quality issues in Iowa! How can we increase nitrogen retention and soil health in Iowa’s corn and soybean cropping systems? 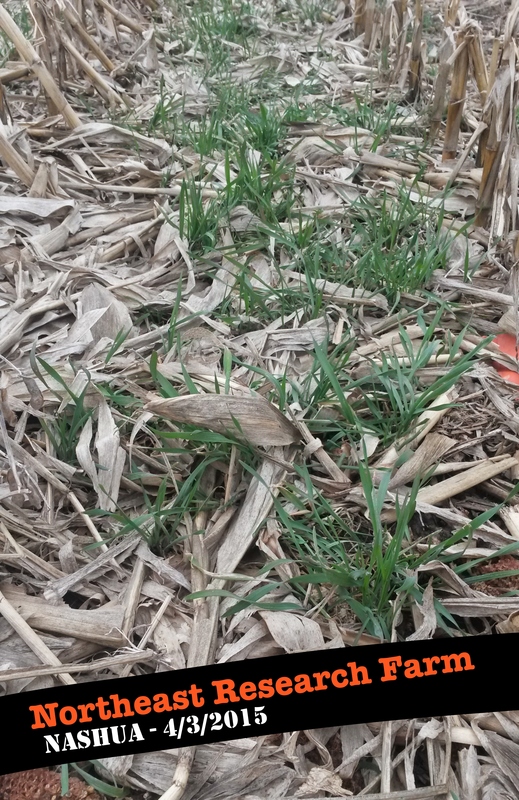 There is not just one single quick fix, but Dr. Mike Castellano, William T. Frankenberger Professor of Soil Science and Associate Professor in the Department of Agronomy at Iowa State University, made the strong case for cover crops in last week’s Iowa Learning Farms webinar. Castellano framed the webinar with a discussion of nitrogen budgets. As he put it, we don’t typically think about financial management without a budget – nutrient management is the same way! 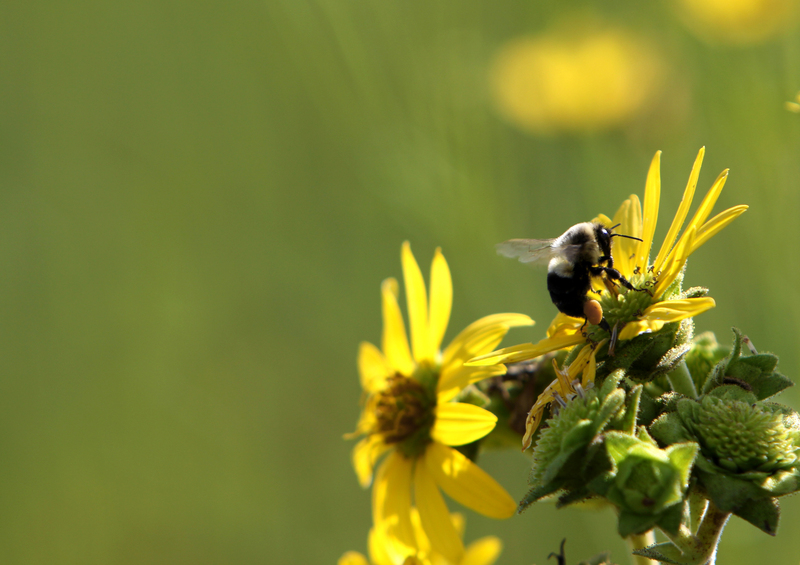 He then explored the potential of cover crops, especially cereal rye, to aid farmers in retaining nitrogen (via the cover crop plant biomass) and building soil organic matter. Watch the full archived webinar on the Iowa Learning Farms website: https://connect.extension.iastate.edu/p6kfk1qr4te/. 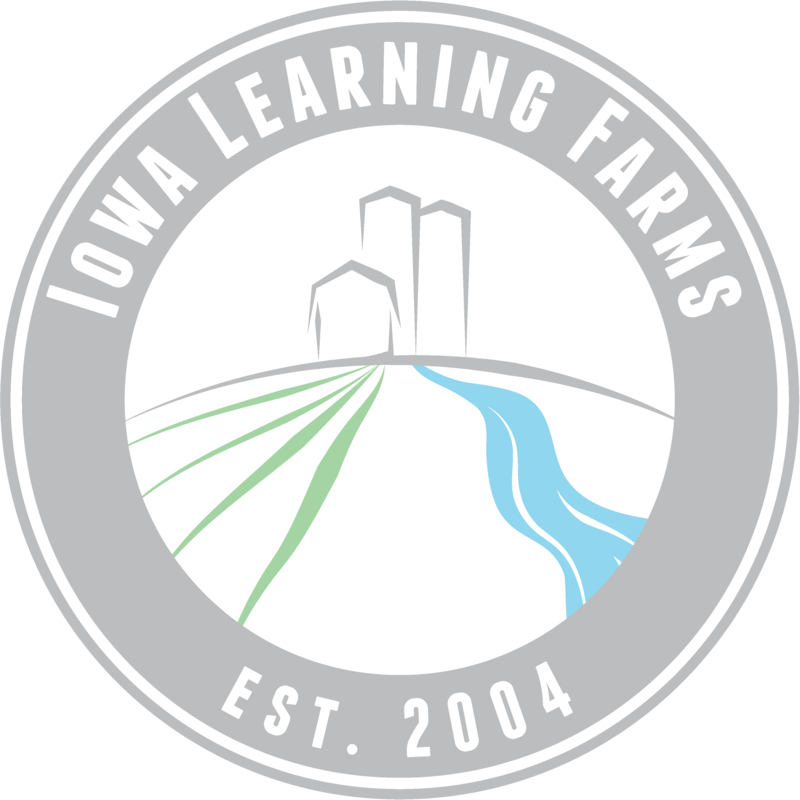 Again, you can check out the full presentation on the Webinar Archives page of the Iowa Learning Farms website. The next Iowa Learning Farms webinar will be Wednesday, October 19 at 1:00 p.m., featuring our own Dr. Matt Helmers. He will be addressing common questions and misconceptions regarding cover crops, drainage, and more … think Mythbusters meets water quality! It’s sure to be a lively conversation. My name is Hannah Corey, and I am a sophomore in Agronomy at Iowa State. I was raised on a farm near Lake City, Iowa along with my brothers, some cattle, and a whole lot of corn and soybeans. The Late Spring Nitrate Test is used to determine the amount of nitrate in the soil available to corn plants in late spring when the corn is 6-12 inches tall (we sampled statewide this past week, June 6-10). It’s a straightforward process designed so that farmers can do it in their own fields without much hassle. The tools of the trade are simple: a soil probe, a clean bucket, and a bag to put the sample in. Our plots on the research farms are no-till and alternate between single-species cover crop, mixed-species cover crop, and no cover crops. In each plot we pull eight different soil cores and mix them together to form one composite sample. Each core is a standard 12 inches deep and ¾ inch in diameter. We pull cores in a diagonal line across the plot to get a sample that accurately represents the area. Added bonus: it’s also a great arm workout! After the samples are bagged and labeled, they are sent to the lab to be analyzed for the nitrate content of the soil. 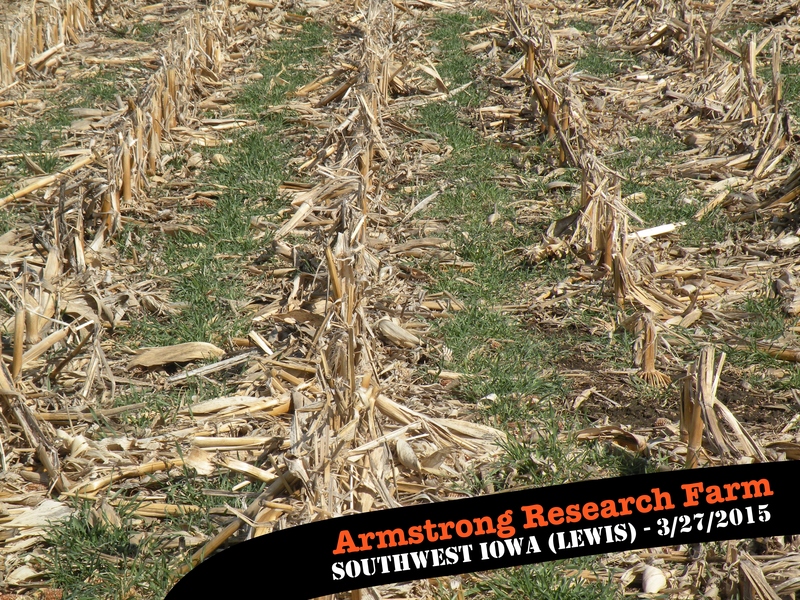 The Iowa Learning Farms team uses this data for research, but with data from their own fields, farmers can also use the Late Spring Nitrate Test in their operations. 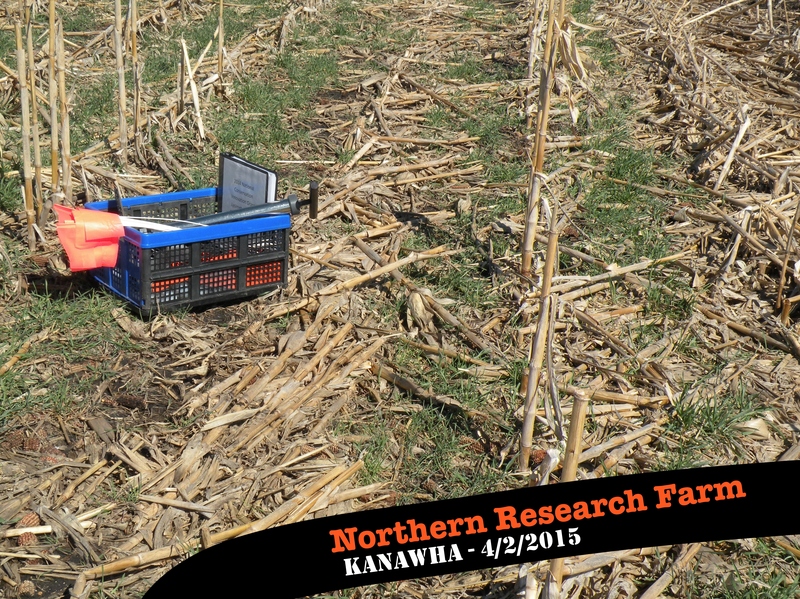 A composite sample from the Nashua Research Farm bagged, labeled, and ready to go! A Late Spring Nitrate Test can tell a farmer how much nitrate is available to their corn, and whether or not they need to apply additional nitrogen fertilizer. If the soil is low on nitrate, farmers can help their corn by supplying the additional nitrogen it needs to grow. If the soil has adequate or high nitrate levels, they can save money and keep nitrates out of the water by refraining from adding excess fertilizer. To me, the Late Spring Nitrate Test is a win-win-win situation. Proper use of the data collected can help boost corn growth, save money, and improve water quality. Follow our new #dirtyhandsfertileland series on Facebook and Twitter throughout the summer to learn more about what you can do to improve soil health and fertility! As Christmas is now in the past and we turn our minds to 2016, here is a provocative article published in the Washington Post: 10 Things We Should Do to Fix our Broken Food System. Check out the screen shot below for a sneak peek; clicking on the screen shot will take you to the full Washington Post article. 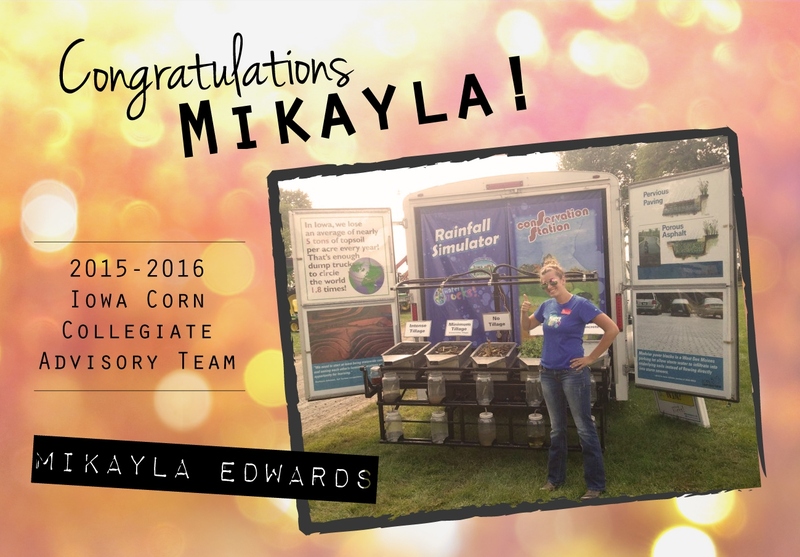 Iowa State University student Mikayla Edwards has been named to the 2015-2016 Iowa Corn Collegiate Advisory Team. The Iowa Corn Collegiate Advisory Team includes 25 student representatives that are enrolled in agriculture programs at community colleges, colleges, and universities across the state. Edwards is studying Animal Ecology and Agronomy at Iowa State University. She is originally from Anamosa, IA, and graduated from Central City High School. Edwards was a 2015 intern with ILF & WR!, where she spent this past summer assisting with soil & water-related research and delivering conservation-based outreach all across the state. Congratulations, Mikayla!